The first reverse mortgage-type loan was written in 1961 by a local banker with Deering Savings and Loan of Portland, Maine, to the widow of his high school football coach. This unique loan arrangement enabled her to stay in her home despite the loss of her husband’s income. In subsequent years, several private banks began offering their versions of a reverse mortgage loan. These worked in giving seniors money based on the equity in their homes, but no FHA insurance had yet been put in place and borrowers had limited protections. 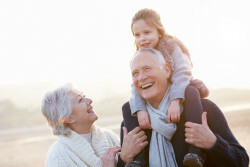 In the early 1980’s the U.S. Senate Special Committee on Aging released a report citing the need for a standardized reverse mortgage program and uniform lending practices. In 1987, Congress passed the FHA insurance bill that would allow HUD to insure reverse mortgages through the FHA. Shortly thereafter, President Reagan signed the FHA Reverse Mortgage bill into law. Over the past 25+ years, reverse mortgages have consistently grown in popularity due to borrower safety, government protections and common sense financial decision-making. Many seniors employing a reverse mortgage are free to enjoy a retirement without monthly mortgage payments or other financial concerns. Give Lineage Lending a call today to learn how the equity in your home can be used to make your retirement a comfortable and worry-free one. It’s your money, why not put it to work for you?